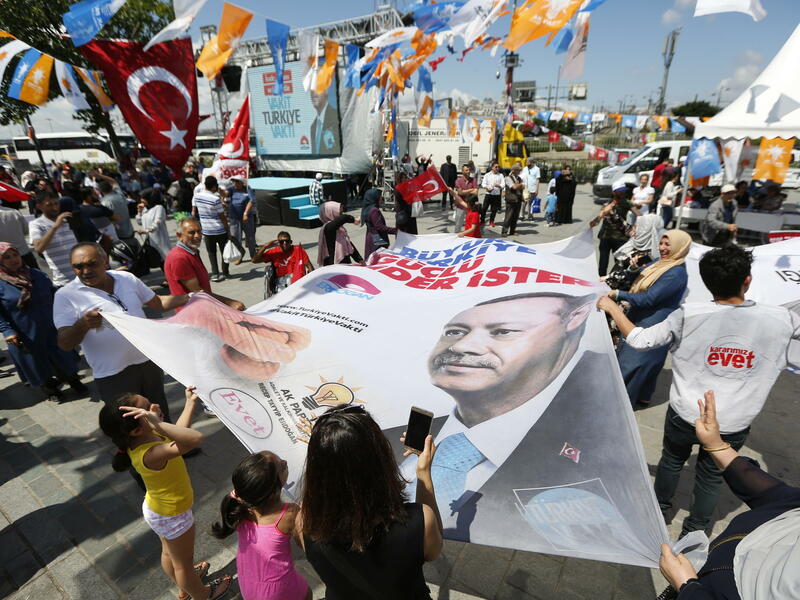 People wave a banner showing Turkey's President Recep Tayyip Erdogan during a gathering of supporters of his ruling Justice and Development Party (AKP) in Istanbul. 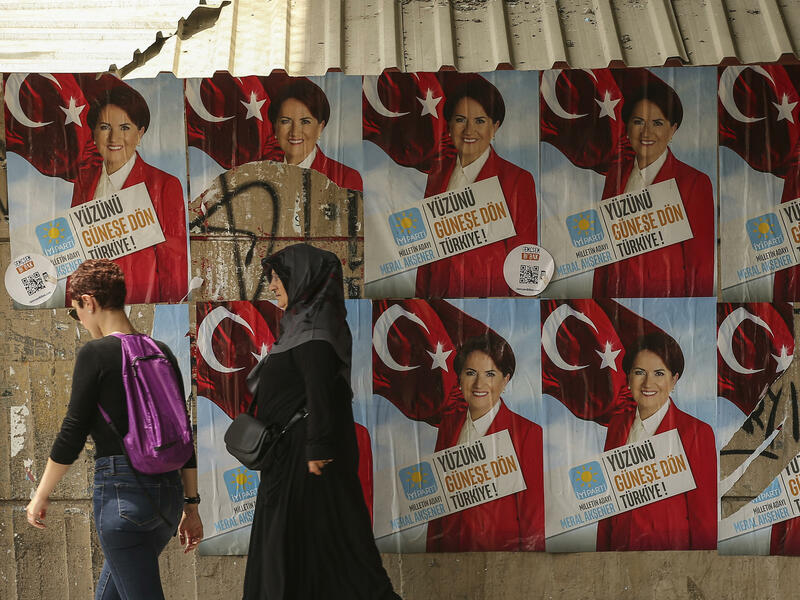 People walk past posters showing Meral Aksener, the presidential candidate from the Iyi (Good) Party, in Istanbul on Thursday. 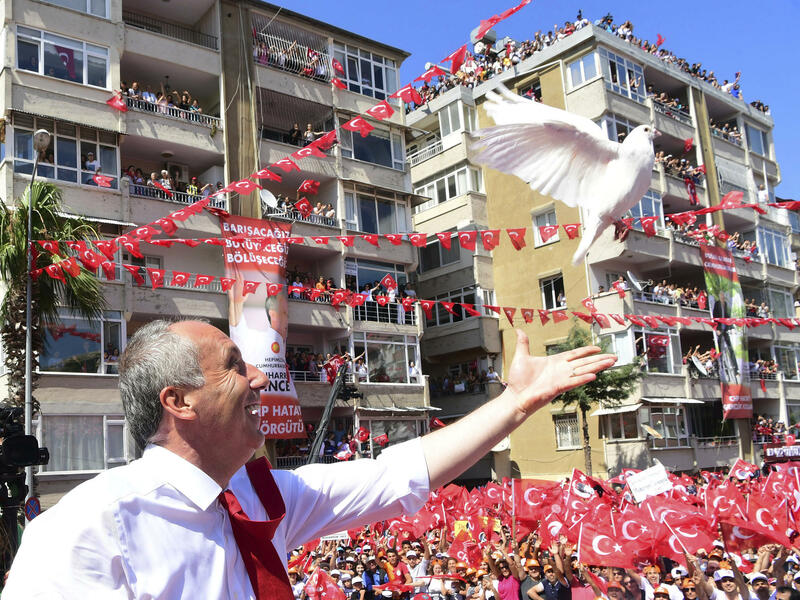 Muharrem Ince, the presidential candidate from Turkey's main opposition Republican People's Party, releases a white dove at an election rally in Hatay, Turkey, on Tuesday. The former teacher is considered Erdogan's strongest challenger. 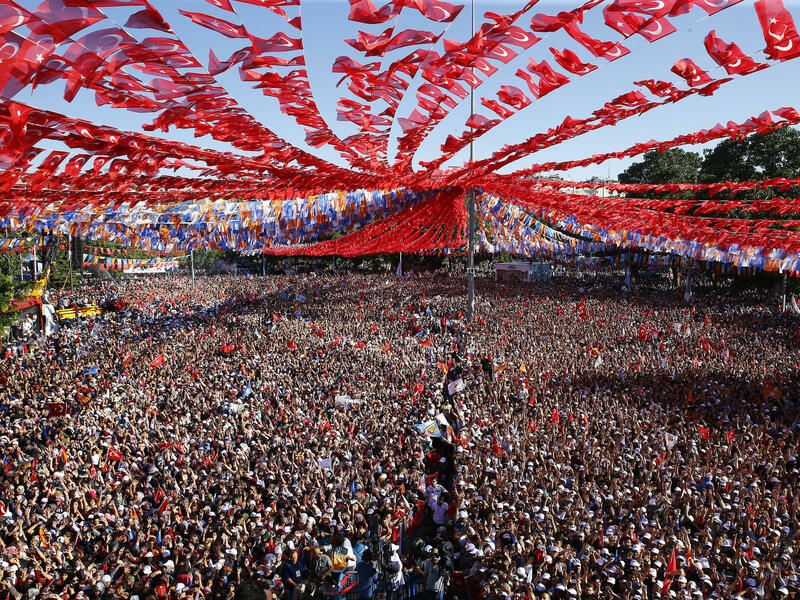 Supporters of Turkey's President Recep Tayyip Erdogan's ruling Justice and Development Party (AKP) attend an election rally in Gaziantep, eastern Turkey, on Thursday. Erdogan has amassed extraordinary power since 2003 — serving as prime minister before he became president — and has cracked down on opponents in what's become known in Turkey as "the purge." He faces five challengers in a crowded presidential contest. Voters will also elect a new parliament. His main challenger is former teacher and current lawmaker Muharrem Ince, from the secular, pro-Western Republican People's Party or CHP. The CHP is Turkey's oldest political party, but in recent elections, it has lagged well behind Erdogan's Justice and Development Party or AKP. Another strong contender is Meral Aksener, who broke away from Turkey's main ultra-nationalist party, the MHP, when its leaders threw their support behind Erdogan and the AKP. Aksener, the only female presidential candidate, formed her Iyi (Good) Party in hopes of building an anti-Erdogan coalition. Selahattin Demirtas, the co-leader of the pro-Kurdish People's Democratic Party (HDP), the second-largest party in parliament, is campaigning from a jail cell. 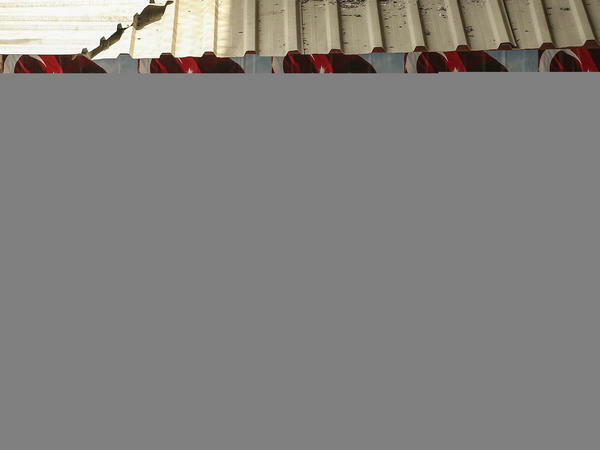 Imprisoned for 20 months, he is awaiting trial on terrorism-related charges. "The government has so far started 102 investigations and filed 34 separate court cases against me," he wrote in a June 20 op-ed for the New York Times. "If it has its way, I will face 183 years in prison." The two other presidential candidates are Dogu Perincek of the left-wing, nationalist Patriotic Party and Temel Karamollaoglu of the Islamist Felicity Party. What's new about these elections? They signal the end of Turkey's parliamentary system of government, in which the party that wins control of the legislature forms the government. This time, voters are being asked to take part in two votes — one for parliament and the other for a "strong president" who will take over the powers formerly held by the prime minister. So Prime Minister Binali Yildirim's job will disappear. He has said if Erdogan wins, he expects to be named vice president. The next president will have the power to rule by decree, though parliament will have some power to block presidential moves via legislation. The changes, approved by voters in a surprisingly close referendum vote last year, open up scenarios that may look familiar to many Americans but will be new for Turks. For instance, it's not unusual for a U.S. president to face a Congress controlled by the other party. That scenario is now possible for the first time in Turkey. But there's a key difference: An American president faces significant checks and balances in the form of an independent judiciary. Opposition candidates in Turkey say Erdogan has undermined the independence of Turkey's judiciary, and would have a much freer hand in pursuing his agenda so long as the opposition doesn't win a clear majority in parliament. This new system also affords Erdogan the possibility of two more five-year terms in office, and conceivably a third, should parliament call snap elections in his final term. As in many elections around the world, voters in Turkey are worried about their country's economic future. Some say Erdogan moved these elections up over concern that the economy might not stay strong. At the moment, the IMF is estimating Turkey's 2018 growth at a strong 4.3 percent of GDP. But there are warning signs: the Turkish lira has fallen by 20 percent against the U.S. dollar this year, and inflation is rising. "We not only import all of our oil but most of our cars, our telephones and even our McDonald's," says analyst Atilla Yesilada at GlobalSource Partners in Istanbul. "So the prices of everything that a Turk considers a luxury or a sign of good life has suddenly gone up. As a result, Turks don't really feel the positive impact of growth." Once thrown in jail for reciting an Islamist poem, Erdogan has risen from Istanbul mayor to become the most dominant Turkish politician since Mustafa Kemal Ataturk, the founder of the Turkish Republic. In his early years, Erdogan was seen as a reform-minded leader pursuing Turkey's membership in the European Union. These days, he's more often cited as head of a growing authoritarian and populist movement, while his opponents are positioning themselves as more democratic, promising to undo the changes Erdogan pushed through last year. Opposition candidates say Erdogan used a failed 2016 military coup attempt to launch a sweeping crackdown on his political opponents, sacking some 150,000 academics, judges, police and civil servants and bringing charges against thousands more. The secular CHP says if it comes to power, it will give many of those people back their jobs and roll back the crackdown. They also say they'll end the state of emergency that's been in effect since the coup attempt. (Erdogan recently adopted that position too). Under the emergency, people can be jailed without charge for extended periods. Selahattin Demirtas' campaign could prove important: a strong showing by his pro-Kurdish party could deny Erdogan a clear majority in parliament. But the government has made voting more difficult in Kurdish-majority areas, citing "security concerns," and has shifted polling places to new, more distant locations. Under Erdogan, Turkey's ties with the U.S. have grown increasingly strained, as he looks to Russia and even Iran to address regional issues. Ankara is angry over U.S. support for Syrian Kurdish YPG forces in northern Syria, and Washington worries about Turkey's decision to purchase Russian S-400 missiles — something that prompted the U.S. Senate to support blocking the sale of U.S. F-35 fighter jets to Turkey. 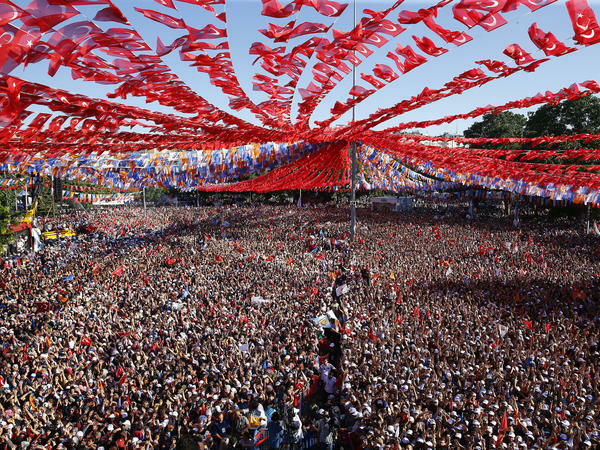 Polls in Turkey do not have a stellar track record for accuracy. So far, they suggest Erdogan will get the most votes in the presidential contest — but there's an important caveat. Under Turkey's election laws, if he doesn't win more than 50 percent of the vote on Sunday, he'll have to face a runoff with the second-place candidate — likely the CHP's Ince. In that case, the opposition will be hoping for a unified anti-Erdogan vote. And Erdogan's supporters will be hoping that the pollsters are right in forecasting a win for the incumbent.